At the start of the season, there were questions galore about Kris Letang’s future. When would he return to the Pittsburgh Penguins? When that time comes, will he be the same player as before? Will such an invasive surgery — which, Letang had in April last year to correct a herniated disk in his neck — impact the longevity of his career? Fair questions, indeed. And the answers, at least for the first three months of the season, was opposite of what everyone had hoped. Maybe it was rust. Prior to his return this season, Letang had not played since Feb. 21 last year. Maybe he was gun-shy? Letang’s biggest issues weren’t necessarily with mobility, but he was a turnover machine on a nightly basis and seemed indecisive with the puck. Playing positionally sound hockey isn’t necessarily his greatest strength and normally, a player of his caliber can get away with risky pinches and over-committing due to his speed and skating ability. He’s a guy that you want taking chances because of his ability to generate so much off the rush and recover quickly, but that wasn’t the case throughout the first half of 2017-18. In other words, he wasn’t Kris Letang. Throughout his struggles, everyone was quick to criticize him. And to be fair, Letang wasn’t exactly happy with himself. His turnaround hasn’t received as much attention, though, and to his credit — he’s been very good in 2018. This year has truly been a tale of two seasons for Letang. And while he still isn’t necessarily back to his dominant self, he’s certainly showing that his game is returning to form right on time for a Penguins run at a third consecutive Stanley Cup. Prior to the new year, Letang — normally a pivotal piece in Pittsburgh’s offensive attack — was averaging just .38 points per hour of even strength play. According to NaturalStatTrick.Com, that sort of production ranked 191 in the league among defensemen with at least 200 minutes of ice time throughout the first three months of the season. To put that into perspective, when his injury ended his 2016-17 campaign, he was clicking at 1.14 points per hour and ranked 16th. Quite the drop-off in production and it was a large part of why the Penguins struggled so badly to generate offense during that period. He’s a crucial piece of what Pittsburgh does, and when he isn’t rolling, the team’s overall scoring numbers are impacted greatly. Defensively, Letang’s indecisiveness and his seemingly sky-high number of turnovers were the main issues. However, the Penguins still owned over 52-percent of scoring chances while he was on the ice — they just didn’t capitalize very often. For those who cite plus/minus as a relevant stat, consider that the Penguins’ goaltenders were boasting a dismal .878 even strength save percentage with Letang on the ice so placing all the blame on him isn’t fair. Was he good in his own end? Far from it. His struggles stretched to all areas of play. So, ultimately, he wasn’t the main problem but he was certainly a part of the problem, rather than part of the solution. Thankfully for the Penguins, all of that is seemingly in the past now. Outside of celebrating a Stanley Cup victory with his team, despite his inability to play in the postseason, 2017 is a year Letang will want to keep in his rearview mirror. Since Jan. 1, 2018, the Penguins have accounted for over 60-percent of scoring chances with Letang on the ice at even strength. Even better — at least, in terms of individual production — his points per hour has jumped to .81 in that span. Letang, like the majority of Pittsburgh’s roster, turned it up when the calendar flipped to 2018 and while he isn’t yet the pre-surgery version of himself — he’s getting there. That’s great news for a Penguins team that looks poised to compete for a third consecutive Stanley Cup. 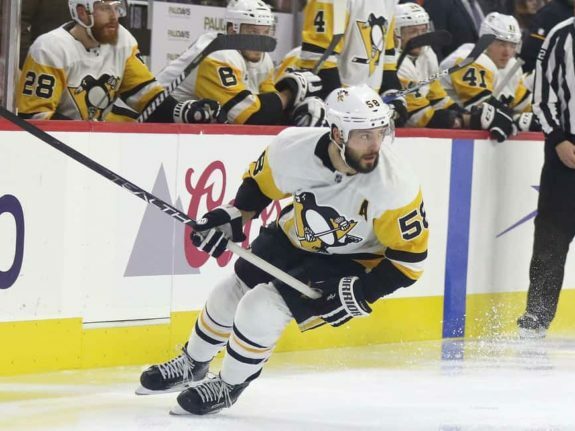 With Letang alongside his most common defensive partner, Brian Dumoulin, the Penguins have controlled over 54-percent of even-strength shot attempts and own over 55-percent of all goals scored. Pittsburgh also accounts for nearly 57-percent of all scoring chances and when you consider that this duo faces every team’s top offensive threats — that’s impressive. Oh, and for those who remain concerned about his plus/minus, he’s a plus-9 in his 24 games since Jan. 1 without a large uptick in Pittsburgh’s even strength save percentage. A testament to how well he’s producing. Pittsburgh may have dropped two in a row, but they rattled off six straight wins prior to that. Letang is back, nearing his usual form and the Penguins, across the board, are scary good right now. 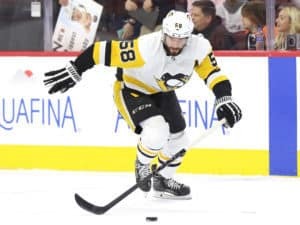 Whether or not they can three-peat and Letang get a shot at defending their Stanley Cup — a privilege his herniated disk took away from him one year ago — remains to be seen. From the looks of it, though, if that opportunity presents itself, he’ll be ready to step up.